SEATTLE – Jan. 21, 2010 – YachtWorld.com, the world’s leading Internet yacht brokerage portal and a division of Dominion Enterprises, today announced that it has launched new mobile Web sites for the U.S. and the U.K. Optimized for iPhone/iTouch, Blackberry (OS4.6+) and Android devices these new Web sites are ideal for people on the move. They are streamlined versions of the full service Web sites that allow visitors to search boats for sale, view the boat details and photos, and contact the appropriate broker for more information. YachtWorld.com is the single most powerful and effective global marketing solution for the boating industry. With over 114,000 brokerage boats worldwide offered by over 2,400 yacht brokerage houses and 10,000 individual yacht brokers in 100 countries, YachtWorld.com receives nearly 2.5 million global visits by boating enthusiasts each month. About YachtWorld.com – YachtWorld.com is the single most powerful and effective global marketing solution for the boating industry. With over 114,000 brokerage boats worldwide offered by over 2,400 yacht brokerage houses and 10,000 individual yacht brokers in 100 countries, YachtWorld.com receives nearly 2.5 million global visits by boating enthusiasts each month. 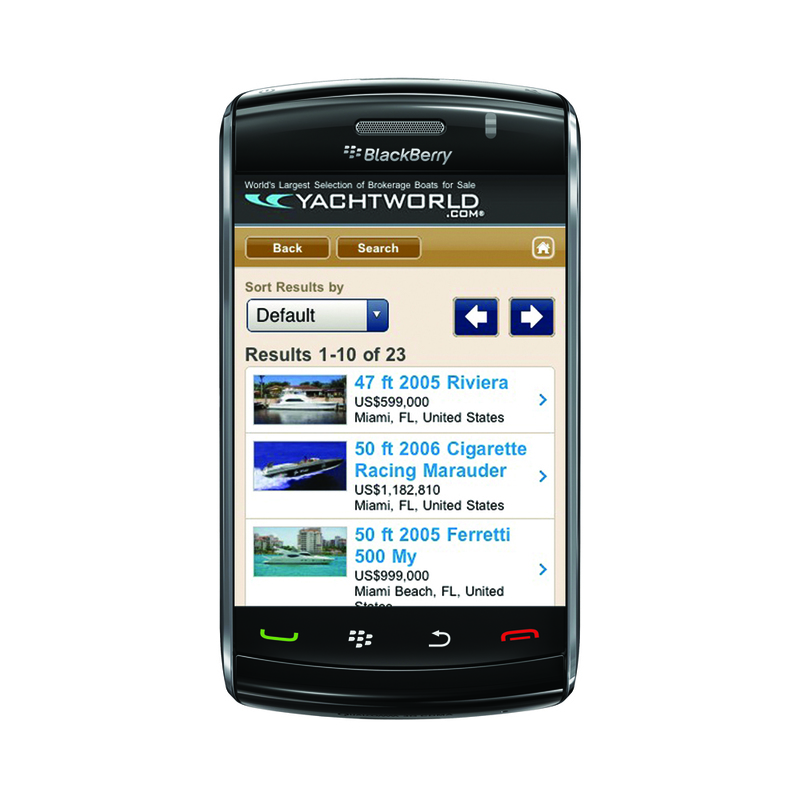 YachtWorld.com provides a complete suite of online marketing services for its yacht broker members through BoatWizard and SoldBoats, their proprietary back-end tools. Headquartered in Seattle, Washington, YachtWorld.com has European headquarters in the United Kingdom, with sales and customer service representation in France, Germany, Italy, Holland, Turkey and Estonia. YachtWorld.com is a division of Dominion Enterprises, based in Norfolk, Virginia, USA. About Dominion Enterprises – Dominion Enterprises is a leading marketing services company serving the automotive, enthusiast and commercial vehicle, real estate, apartment rental, and employment industries. The company’s businesses provide a comprehensive suite of technology-based marketing solutions including Internet advertising, lead generation, CRM, Web site design and hosting, and data management services. The company has more than 45 market-leading Web sites reaching more than 16.7 million unique visitors, and more than 450 magazines with a weekly circulation of 4.3 million. Headquartered in Norfolk, Virginia, the company has 5,400 employees in more than 200 offices nationwide. For more information, visit http://www.DominionEnterprises.com. This entry was posted in Boating Industry, Business by Mike Dickman. Bookmark the permalink.